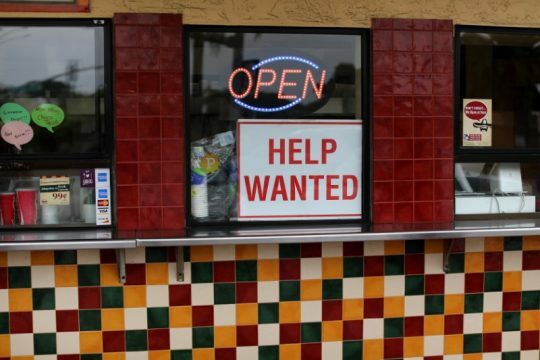 WASHINGTON (Reuters) – U.S. job growth increased less than expected in April and the unemployment rate dropped to near a 17-1/2-year low of 3.9 percent as some jobless Americans left the labor force. The Labor Department's closely watched employment report on Friday also showed wages barely rising last month, which could ease concerns that inflation pressures were rapidly building up, likely keeping the Federal Reserve on a gradual path of monetary policy tightening. Nonfarm payrolls increased by 164,000 jobs last month, the Labor Department said on Friday. Data for March was revised up to show payrolls rising by 135,000 jobs instead of the previously reported 103,000. That was still the fewest amount of jobs created in six months and followed an outsized gain of 324,000 in February. Job growth is moderating as the labor market hits full employment. There has been an increase in reports of employers, especially in the construction and manufacturing sectors, struggling to find qualified workers. The drop of two-tenths of a percentage point in the unemployment rate from 4.1 percent in March pushed it to a level last seen in December 2000 and within striking distance of the Fed's forecast of 3.8 percent by the end of this year. It was the first time in six months that the jobless ratedropped. But 236,000 people dropped out of the labor force. The labor force participation rate, or the proportion of working-age Americans who have a job or are looking for one, fell to 62.8 percent from 62.9 percent in March. Economists polled by Reuters had forecast payrolls rising by 192,000 jobs in April and the unemployment rate falling to 4.0 percent. Average hourly earnings rose four cents, or 0.1 percent, last month after gaining 0.2 percent in March. That left the annual increase in average hourly earnings at 2.6 percent. The average workweek was unchanged at 34.5 hours last month. While average hourly earnings have suggested only a gradual increase in wage inflation, other measures have been more robust. The Employment Cost Index (ECI), widely viewed by policymakers and economists as one of the better measures of labor market slack, increased solidly in the first quarter. The ECI report showed wages rising at their fastest pace in 11 years during the period. Even with the annual increase in average hourly earnings still moderate, inflation is flirting with the Fed's target. The Fed's preferred inflation measure, the personal consumption expenditures price index excluding food and energy, was up 1.9 percent year-on-year in March after a 1.6 percentrise in February. The U.S. central bank on Wednesday left interest rates unchanged and said it expected annual inflation to run close to its "symmetric" 2 percent target over the medium term. Economists interpreted symmetric to mean policymakers would not be too concerned with inflation overshooting the target. The Fed hiked rates in March and has forecast at least two more increases for this year. Economists expect the unemployment rate will drop to 3.5 percent by the end of the year. The economy needs to create roughly 120,000 jobs per month to keep up with growth in the working-age population. Construction payrolls rebounded by 17,000 jobs last month after recording their first drop in eight months in March. Manufacturing employment increased by 24,000 jobs in April after a gain of 22,000 positions in March. The retail sector added 1,800 jobs. Payrolls for temporary help, seen as a harbinger of future permanent hiring, rose by 10,300 after falling by 2,100 in March. Leisure and hospitality employers added 18,000 jobs last month. Government payrolls fell 4,000 in April. This entry was posted in Issues and tagged Department of Labor, Economy, Jobs. Bookmark the permalink.